On October 23, 50-year-old Teresa Michelle Gratton wrote a letter to her husband Herb Gratton, her partner of 32 years, “PLEASE GET ME OUT OF HERE I DON’T BELONG HERE!! HELP ME! HELP ME! PLEASE!!!!!! … I don’t see how they can continue to keep me locked up like a criminal. I have no charges. I had already paid my time for my crime. I’ll leave Canada if that’s what it comes to, but let me out until that’s what’s desided (sic) if it comes to that.” A week later, on October 30, Teresa Gratton – beloved mother, grandmother, wife, life partner, permanent resident of Canada – was “found in medical distress”. Herb Gratton received a phone call, “Your wife died.” That was all that was said. To this day, the family does not know, and demands to know, what happened to their loved one. What happened to Teresa Gratton? The State murdered her. Canada murdered her. The global system of `immigrant detention’ her. To the extent that the system of immigrant detention continues, we all had a hand in murdering Teresa Gratton. Everything about Teresa Gratton’s story is familiar, the entire spectacular of State indignity, brutality, and silence, with the family’s anguish as backdrop and soundtrack. Herb Gratton, 58 years old, was born in Canada. When he was 13, he and his mother moved to Nashville, Tennessee. In 1985, he met Teresa. He says for him it was love at first sight. They dated, the moved in together, they started a family. They have three sons, Matthew, now 30 years old; Stan, 27; and Jacob, 24. Matthew and Stan are married with children. After 18 years together, Herb and Teresa were formally married, in 2003. Not long after, they moved to Canada. Herb, Matthew, Stan, Jacob, and all their children, are Canadian citizens. Teresa Gratton had been a legal permanent resident in Canada since 2011. In 2004, Herb Gratton suffered a back injury. The couple’s financial situation deteriorated. Teresa Gratton worked off and on as a house cleaner. Teresa Gratton lived with fibromyalgia and osteoarthritis, which resulted in chronic pain, and anxiety and depression. She relied on hydromorphone, an opioid, which she obtained legally. Teresa Gratton had a series of minor run ins with the criminal justice system. At the advice of her attorney, she pled out. That resulted in Teresa Gratton suddenly ending up in the immigrant detention system. Despite all evidence to the contrary, she was deemed a flight risk, and so was moved from was transferred from the Elgin-Middlesex Detention Centre in London, where her family lives, to the maximum security wing of Vanier Centre for Women, nearly 100 miles away. Herb Gratton doesn’t have a car. No one informed Herbert Gratton of the move. He had no idea where his wife was until she called him from Vanier. Why was Teresa Gratton sent to Vanier Centre for Women? To die. 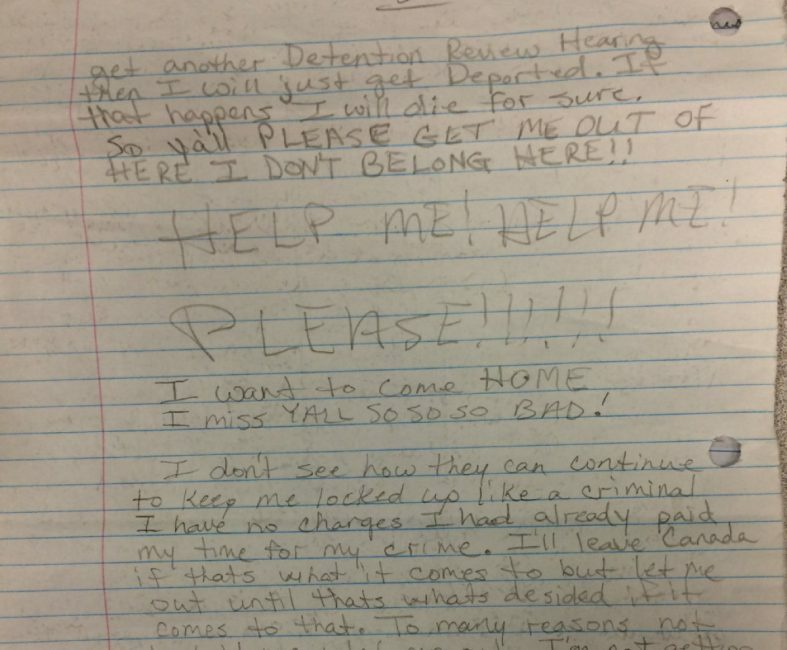 Since 2000, at least 17 people have died in Canada’s immigrant detention system. In 2013, Lucia Vega Jimenez was found hanging from a shower stall in the `immigration holding center’ at the Vancouver airport. Reporters, friends, advocates asked many questions. Silence. Lucia Vega Jimenez’ case was a cause celebre, and yet here we are, four years later, and Teresa Gratton is dead, and her family, to this day, awaits information, something more than, “Your wife is dead.” Something more than silence. Something to answer their loved one, Teresa Gratton, crying, screaming in agony, “PLEASE GET ME OUT OF HERE I DON’T BELONG HERE!! HELP ME! HELP ME! PLEASE!!!!! !” PLEASE!!!!!! On December 20th 2013 Lucia Vega Jimenez committed suicide, hanging herself in a shower stall of a bleak border facility at the Vancouver International Airport under the jurisdiction of Canada Border Services Agency, CBSA. She died eight days later in a hospital. The Transit Police arrested Lucia for two reasons. First, she did not purchase her bus ticket. Second her name and origin could be the source of a serious offense. It became a life-and-death offense for Lucia. After her arrest, her fate was in the hands of CBSA, who sent her to their Vancouver airport facility to await deportation. The news of Lucia Vega Jimenez’s death surfaced over a month after she died. It has generated a number of outcries and questions. But what are the questions? Why was she detained in quasi isolation with no contact allowed with friends and family members? What is the border that the CBSA is “defending” so harshly? Exactly what borders are we talking about, as all sorts of merchandise and products travel freely thanks to manipulative trade agreements? Moreover, a certain code of silence surrounds the way the global market trade system impoverishes and destabilizes populations, especially women. This question of lack of independent oversight has been challenged by the BC Civil Liberties Association and No One Is Illegal, a grassroots organization that works to end detention for migrants in Canada. Then, should we question the fact that the CBSA has contracted with a private firm (Genesis Security)? Despite some 7000 signatures on a petition that demands an “immediate public inquiry and a comprehensive review of migrant detention policies,” the tone of some comments from forums such as a local TV forum reveals that the general public has been rendered insensitive to these questions of detention of migrants. The reality of Lucia’s death in isolation, the reality of a woman who worked and lived in Vancouver as a domestic worker, vanishes under the views that she was “illegal” and responsible for killing herself. These populist utterances are encouraged and help to camouflage the reasons for border security that justify the mistreatment of migrants and the surveillance of everyone. 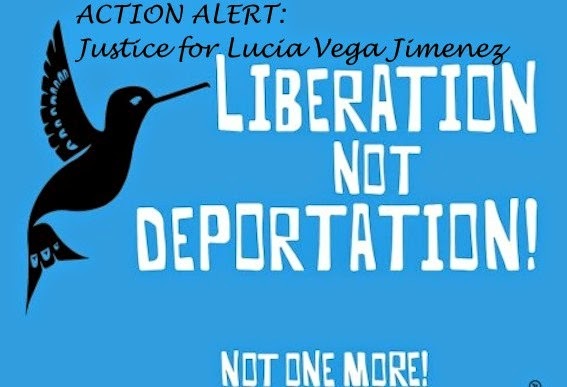 We should wonder how borders have become private and secretly run to serve the global market and how in the midst of privatization and deregulation policies, Lucia Vega Jimenez had come to prefer to kill herself rather than being deported. We should wonder about the complete indifference of officials who pride themselves in defending their country, but defending their country against what? Who tied the knot that killed Lucia Vega Jimenez? 42-year-old Mexican immigrant Lucia Vega Jimenez died on December 28, 2013. On December 20, she was found hanging from a shower stall in the `immigration holding center’ at the Vancouver airport. Apparently, she had been hanging, without oxygen, for at least 40 minutes, before she was cut down and sent to hospital. Who tied the knot? Canada. The global system of `immigrant detention’. Everyone. Everything about Lucia Vega Jimenez’s story is familiar. And it doesn’t end with her death. The CBSA did not release any information for almost a month, and the `information’ has been obstructionist and opaque. So, the world asks questions.